Risport Figure Skates and figure skating boots. We have great prices on Risport Boots. Risport Figure Skates are worn by U.S. & World Champions. We are the Preferred Online Dealer for Risport Skates and Figure Skate Boots. Risport Boys/Mens Figure Skates. Risport Figure skates and figure skating boots for men and boys. Risport Girls/Womens Figure Skates. 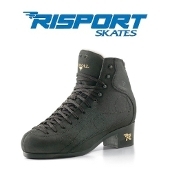 Risport figure skates and figure skating boots for and women. Risport Figure Skates and Risport figure skating boots are a high quality figure skating boot made in Italy. Founded by Armando Rizzon in 1972, Risport has been making quality handcrafted premium figure skating boots ever since. Risport figure skates are also a great transition skate from skaters who no longer want and Edea skate, but like a similar fitting boot. From the beginner model Risport Scott Hamilton figure skates to the more advanced Risport RF1 figure skating boots, skaters from all levels will find a boot to meet their needs.